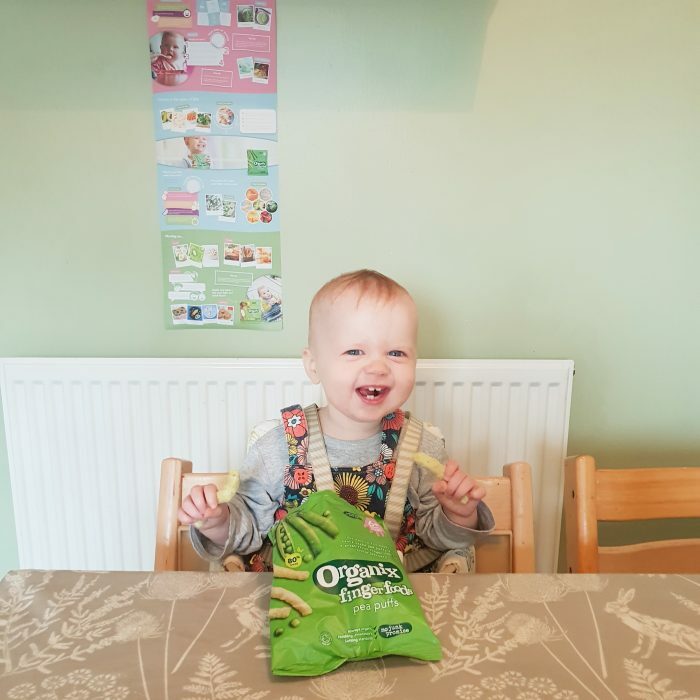 I share a lot about our foodie adventures on here but haven’t really taken the time to talk about how my two little foodie’s weaning journeys started. 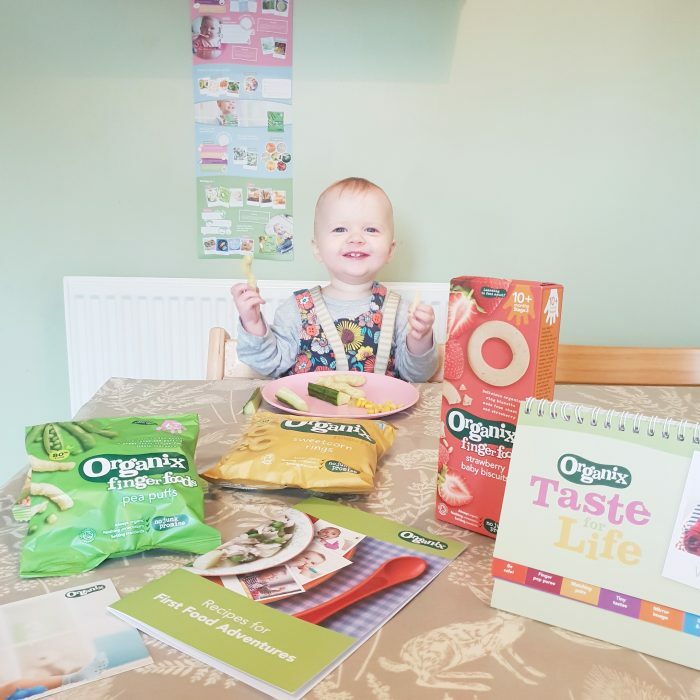 I was so pleased when Organix asked me to share a post all about our first food adventures. Both of my children have been surprisingly similar when it comes to food. I’ve been really lucky that they both weaned really easily. Harry and Megan loved food from the start and made weaning really easy for me as a parent. 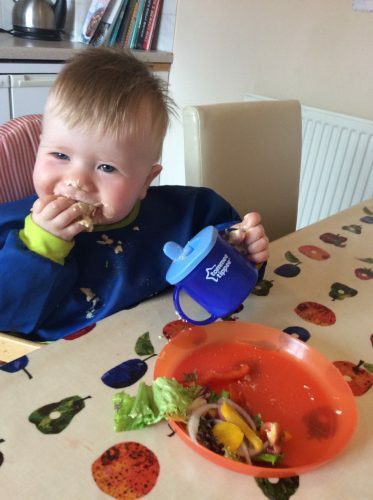 We planned to do baby led weaning with both children but did help them with spoons when it came to wet foods like yoghurt. With Harry, we made a conscious decision to start weaning. We bought a new dining table, set up a high chair and lovingly prepared steamed vegetables for his first tastes of food. With Megan she decided when she was ready. We always sat around the table together at dinner time, us with our dinner and Megan in her high chair with some toys. One day, when we were eating a roast dinner, Megan leaned over, took a carrot from my plate and ate it. Simple as that! She was off! I think that having her sat at the table with us when we ate for the months leading up to weaning really helped to get her off to a good start. I’m a firm believer that eating together as a family is an important part of setting up good eating habits for life. While weaning both children we never really prepared ‘baby food’ for them. They always had a version of what we were eating and enjoyed a varied diet from day one. Vegetables, fruit, meat, dairy, pulses, pasta… they ate it all. (Apart from peppers, Harry still wont eat peppers.) The only things we avoided giving were salt, honey and sugar. Although there were some foods that Megan and Harry didn’t like at first we never made a big deal out of it. We just kept offering alongside the foods they enjoyed and didn’t react if they rejected it. Eventually they both tried everything and now have a good, varied diet. 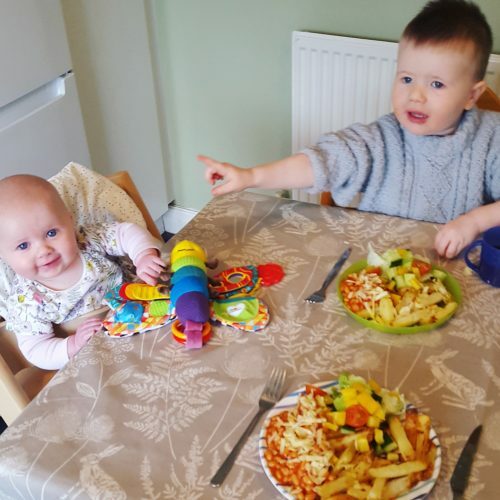 I’d find it difficult to say what Megan and Harry’s favourite first foods were because they were really keen to eat most things but spaghetti bolognese is a definite favourite and porridge fingers were always very well received. Recently Megan has really been enjoying Organix Pea Puffs. They’re great to throw in the baby bag and take out with us. 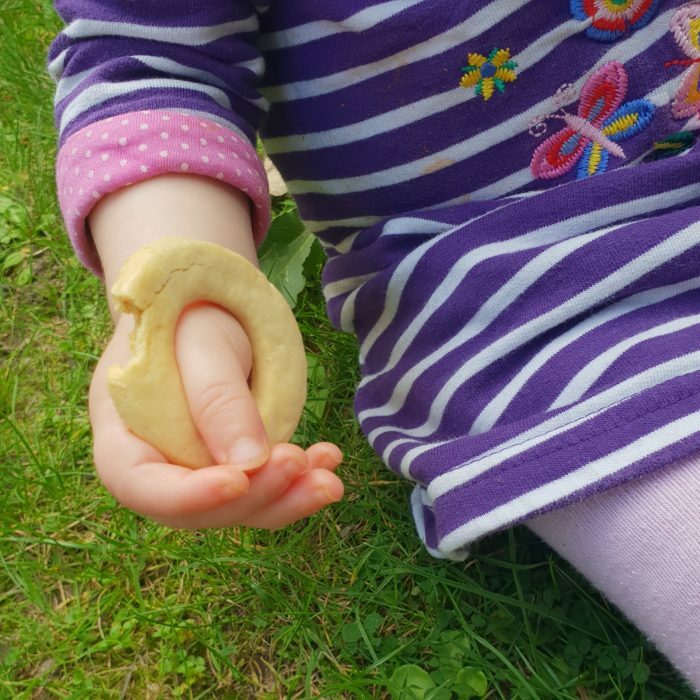 I love Organix snacks for my kids, especially when they’re younger, as I know they’re going to have no hidden nasties lurking inside because of their ‘No Junk Promise’. She also loves these Organix strawberry baby biscuits. They’re perfect for babies as they’re really easy to hold! We were recently sent this Organix ‘first foods’ wall chart which has some great tips for starting weaning. 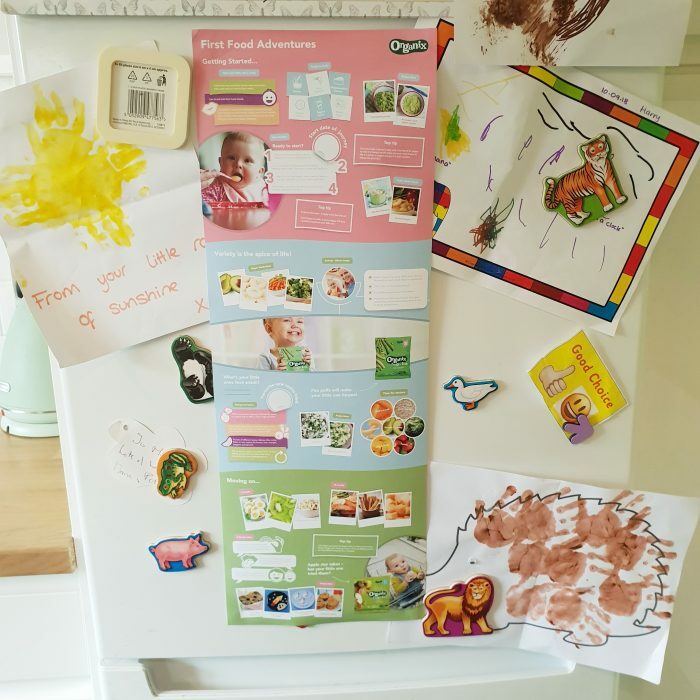 I found it really useful and there’s loads of really simple ideas to help with weaning your little one so I thought I’d share my favourite tips from it and a few of my own too! Try letting your child eat in front of a mirror so they can see themselves and what they’re exploring. Talk to your baby about what they’re eating. Let them play with their food! It’s how they learn! Cereal sticks to high chairs, tables and floors like cement. Seriously, you could build a house with Weetabix! Wipe that stuff off the second it comes into contact with your furniture or you’ll be trying to chisel it off for the rest of forever! Babies don’t need teeth to be able to demolish a plate of food. Hiding in the bathroom to eat something you don’t want to share is perfectly reasonable parenting behaviour. A baby can turn a kitchen into a giant snow globe using only couscous and a lot of determination. What goes in must come out.. Sometimes looking scarily the same as it did when it went in. Also watch out for banana nappies. Brown strings are completely normal in baby’s nappy after eating banana but terrifying if you aren’t expecting to see them and think they’re worms! Stolen food tastes better. Even for babies. It’s ok to use shortcuts! Ready made snacks are so handy, especially while you’re out and about with a weaning baby. Choosing a brand like Organix is a great way of making sure you are giving your child the healthiest option. Tomato soup can rival any fake tan. It gives a ‘healthy orange glow’ that can last for days! Check out the video below to see Megan weaning at 6 months old! Weaning has been a really enjoyable experience in our house. I’ve loved watching my children experience new tastes and textures. The faces they pull when they enjoy (or hate) a food are priceless and it’s a phase of motherhood that I’ll really miss.